Can inanimate objects be haunted? Can a spirit attach itself to a particular thing and then cause unexplained events to occur around it? I received an interesting story from a reader, Laura. An accomplished painter, Laura has sold many of her works to individuals and businesses around the US. One painting in particular, however, is unlike any other that Laura has ever done. Its subject matter, to begin with, is most unusual: it is based on a paranormal photograph -- a photograph that may have captured the image of a headless ghost. Could this ghost have attached itself to Laura's painting? Read her story... and you decide. 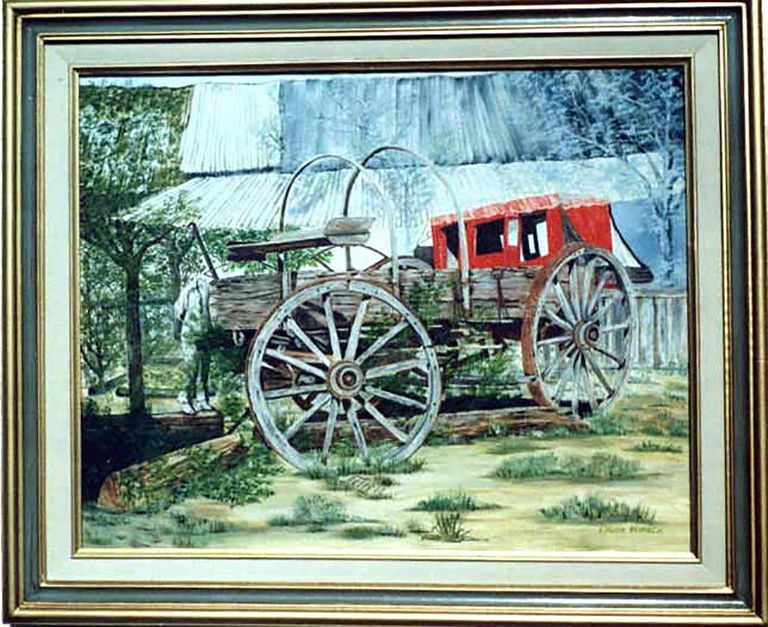 In 1994, James Kidd, a commercial photographer, placed one of his photos on display at a gallery in Tombstone, Arizona where I was showing some of my oil paintings. The photo was the old stagecoach stop at Tombstone. He first took a photo of the stagecoach stop and an old stagecoach, and then he didn't wind his camera so he could get a double exposure photo with another old wagon in the foreground. I couldn't get over that photo and asked him if I could do an oil painting of it. (I do most of my paintings from photos I've taken.) He said I could. Back home in Sierra Vista, Arizona, I began work on a 16 x 20-inch oil painting based on the photo. When I was about halfway through completing the painting, I started getting a strange feeling. I began to ask myself: Why on earth did I want to paint this picture? And maybe I should never have started it. But I did finish it. And then some very strange, unexplained things began to happen around my home -- seemingly centered around that painting. I do not believe in ghosts, but I cannot for the life of me explain how or why these strange things have happened. I cannot attribute every one of these events directly to the painting, but they have all taken place since it has been in my house -- and are totally unexplained. Mysterious leak. In 1995, my husband and I moved into a brand new home in Tennessee. We wondered if this ghostly goings-on would stop. But they didn't. Oddly, the roof on the garage of this new home had a leak when it rained. The roofers came out three times to repair it, and although they worked on it they said they could not find the cause of the leak. It didn't make any sense. Nothing they did stopped the darn leak. Finally, my husband asked me where the ghost painting was. It was leaning against the wall between the living room and garage. We moved the painting... and the garage roof never leaked again. Spilled salt. One evening I was preparing dinner. We had an island bar and that is where I set the table. I picked up the salt and pepper shakers, which were two little canning jars with handles, and set them on the bar. I went to the door and called to my husband that dinner was ready. When I got back to the bar, salt was spilled all over it and on the floor. The salt shaker, standing upright, was still where I had set it down. We have no animals or children in the house to blame for the spill. It is completely unexplained. Telekinetic starfish. My husband and I were sitting in the garage talking to the little neighbor girl who had come over to visit. On the garage wall were three large dried starfish. They were hanging securely on roofing nails. The garage door was open, but there was no wind blowing or air movement. Suddenly, the largest starfish came sailing off the wall and landed on the concrete floor. It sailed across the floor about six to seven feet. Broken gate. A heavy gate that would have been hard to remove, came off its post for no apparent reason. All the hardware was completely intact. The chipped glass. This event really scared me because it could have injured me. We had been doing some yard work and went into the garage to rest where it was cool. My husband said he would mix us some drinks. He returned with the drinks in thick gold-colored glasses with ice cubes. We finished our drinks, and he said he was going to have another and I said I would too. So he mixed them in the house and brought them out. I had taken one or two sips from my drink when I looked down to see that a large chunk of glass had been broken off the top of the glass. It was perfectly fine the first time I drank from it. Right away I thought my husband had knocked it on something, but he swore he hadn't. We looked all over the garage floor for the piece of glass, but found nothing. We went into the house where my husband fixed the drinks and got down on the floor with flashlights and looked. Nothing. I poured the rest of the drink through a strainer to see if the chunk of glass had fallen in, but there was nothing. The missing piece was too large to swallow without me noticing it, but I still had this sick feeling in my stomach. We never found the missing piece of glass. The disbeliever. I have always taken photos of the paintings I have done. People ask to see the photos of my paintings and most always say they don't want to touch the photo of the ghost painting. The gals at the beauty shop wanted me to bring my pictures in, and one woman started bragging that she did not believe in ghosts and that it was silly of them to avoid touching the picture. "Just let me see it," she said. She took the photo, looked at it closely and just laughed. That night at her house, a clock that had been on the wall for 40 years, fell down and broke into a hundred pieces. The hazy figure plays a hand. Our neighbor wanted to show his mother-in-law the photos of my paintings and took them home with him. They left the pictures laying on the table and started playing a three-handed card game in which a dummy hand must be dealt. When they picked up the dummy hand, every card of the dummy hand was in one suit. That scared them to death, he told me. He got up and went outside to move his water sprinkler, and to this day he still swears that he could see a white hazy figure of a person come around the corner. He came running back to my house with the pictures and said he never wanted to touch them again. Knock knock. The last thing this ghost did was knock on our front door. My husband and I both heard it at the same time. But our two German Shepherds did not hear the knock. Nobody was at the door. Currently, the painting is hanging in our house. A few people have asked to buy the painting, but I am afraid to sell it. What would an unhappy ghost do in their lives? I still don't actually believe in ghosts... Yet if I had it to do over, I would not have created this painting. Coincidences? Overactive imaginations? Or is it just possible that some unknown energy surrounds the portrait of the headless ghost?